As far back as we can remember, humanity has been compelled to gather around song. Whether as a centerpiece for celebration, a reflection on loss or a calling to inspire community; in the form of ballads, blues, spirituals and countless other variations, timeless songs have been integral to the narrative of their times. 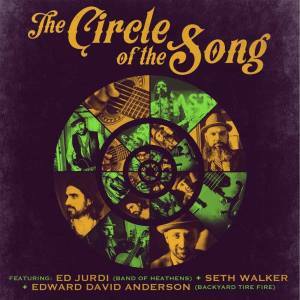 With that idea in mind, three of this generation’s most devoted artists to the art of the song: Ed Jurdi, Seth Walker and Edward David Anderson will head out of the road together to perform in the round, share their extensive bodies of work with one another, pick on a few classics and celebrate…The Circle Of The Song. Prior to 2014, many knew Edward David Anderson best from his critically acclaimed, vintage American rock band, Backyard Tire Fire. That all changed earlier this year, however, when Anderson struck out on his own with his debut solo release, Lies & Wishes. Produced by Steve Berlin of Los Lobos, it presents Anderson’s most autobiographical material yet, exploring the loss of his mother and the dissolution of his band. It’s a collection of songs that embrace vulnerability, while rooted in Anderson’s working class aesthetic. Performer Magazine declared: “Anderson pulls from the pockets of country, blues and Americana, capturing a different hue as the genres shift, in a juxtaposition of warm-hearted openness and biting self-doubt.” Born and raised in the Midwest, Anderson currently splits his time between Bloomington, Illinois and lower Alabama.